The year is 1197. King Kayolan has become the ruler of Bulgaria during a difficult time in history. The land is still recovering from its century long subjugation under the Byzantines. The new king is compelled to exercise a very flexible foreign policy in order to strengthen his position. Pope Innocent III recognizes Kayolan as a tsar, but it isn't long before the Fourth Crusade is launched and a new conflict begins. 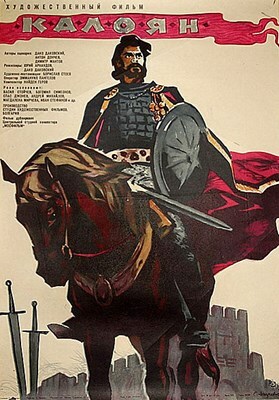 At Adrianople, Tsar Kayolan will face the most decisive challenge to his reign; and what happens there will determine Bulgaria's history for many years to come. DVD-R is in Bulgarian with switchable English subtitles. Approx. 101 mins. See film sample for audio and video quality!